As a member of the Canadian Society of Artists，DU Tao (Tony Du) Overseas Chinese Affairs Office of China's State Council recently accepted the kind invitation，Go to the Tibetan plateau folk songs，Simultaneously literary and artistic creation. The event "Cultural China • known Chinese painter trip to Tibet" collection activity，There were from the United States, Canada, Japan, Australia, France, Italy and other 11 countries and regions, nearly 20 well-known Chinese painter attend.Within half，They went to the Potala Palace in addition, Tashilhunpo, the Yarlung Zangbo Grand Canyon and other places to visit, painting outside，Also with local organizations concerned with pen, seminars and other forms of communication. China Overseas Chinese Affairs Office of the State Council to invite well-known Chinese painter went overseas Chinese folk songs，One purpose is to allow overseas Chinese artist personal experience life in the state of China's political, economic and social development and people's，Arouse inspiration. Pro before going to Tibet，Du Tao and his party first in Beijing Poly Syria，Ataekuni 僑辦 deputy chief what 亞非 etc. Nobu-dan "Chukuniyume". What 亚非 display，Overseas Chinese calligraphy terms，Very important point is to "ground gas." Art is the continuous improvement in the process of mutual consultations, resulting in inspiration，Overseas Chinese Affairs Office of the State Council also hopes to build a platform for cultural exchange through this activity，Let the world of Chinese artists have the opportunity to communicate with each other and promote each other，Improve together; but also with the Chinese national artists exchange ideas，Promote Chinese culture to the world. The group of Chinese folk songs artists from around the world，Everyone in Tibet have knowledge and understanding of different，After ten days of visits, field trips，Tibet witnessed the development and prosperity，Tibet has a more in-depth understanding. The activities for Chinese artists from around the world more than a showcase of Chinese culture theme，Including minority cultures in China. During mingling activities in Lhasa, Xigaze, Nyingchi and other places，Du Tao and other famous local painter made calligraphy pen exchange and discussion. At the forum，Man United Chairman of the Tibet Autonomous Region and the Autonomous Union Han Shuli Vice President Jimmy • Flat-order paper briefly introduces the development history of Tibet and Tibetan history painting, etc.，Mingling group and answered questions of concern. During the creation of groups of Tibetan folk songs Tibet Paintings, calligraphy, poetry, and a total of more than 80 pieces. State Bank of Overseas Chinese Affairs and organized collection activity Tibet exhibition in Beijing，Its unique perspective to show the Tibet long human history, splendid culture and the magnificent landscape of mountains and rivers. It is through this opportunity Tibetan folk songs，Du Tao has rich harvest，Show snowy plateau and beautiful Chinese ink through the book. This is his first visit to Tibet，The perception of this line will show the way through the art of painting. Shocking nature of Tibet, and Tibetan folk culture thick pure original ecology，Du Tao generated so creative soul hit. Du Tao calligraphy Kyo，After coming back from Tibet，靈感 Dai發，Again picked up some spare time painting. Nowadays Du Tao has created multiple ink，There are some ideas being. Du Tao was born and raised in Tianjin，And is known as the land of Gyeonggi Tianjin，But an art of the Holy Land，Where artists Canglongwohu. In Beijing there is a unwritten statement，Especially the folk art community，If you do not mix the head first in the face to Tianjin，Can not develop in Beijing. Although Du Tao was born Polytechnic，Once in standing Tianjin large ManabuOsamu 讀汽 car 專業，And companies engaged in the automotive-related businesses，But his childhood love of calligraphy painting，And has to be maintained. Du Tao can say David for family learning，Artistic attainments predecessors put on ear face life，Then at 6-year-old began copybooks. 1979 was admitted to the Tianjin Children's Palace，Teacher 從竇 Fubun teacher apprentices manual method. 1982In，Du 濤拜 Tsu Monsho method house 耿仲 敭為 nurses，Tsutouketamawa end of Qing Dynasty story 奎館 閣體 manual wind. 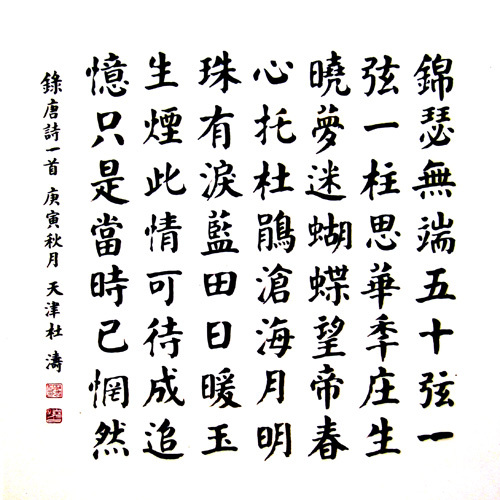 Block letters 于顏 true Sir various monument 沁染 deepest，Proficient in both seal, scribe and Cursive. Cursive Compliance Act II King，By the late Ming Wang Duo and other various family affected lot. Du Tao less hi painting，And considerable talent，Often impressionistic landscapes and literati to entertain ink. In the painting，Has been subjected to Wang Xuezhong, Sun Qifeng, Wang Gong, Mingshan Yu and other famous professor tie. 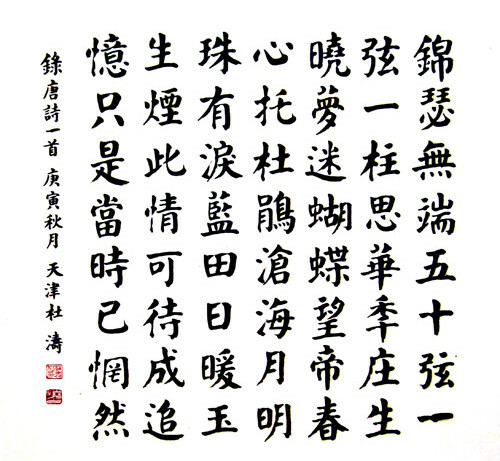 JoRyo calligraphy, E畫，Du 濤還 training engravings，Influenced by his brother in terms of carving，Mr. Xu Meng Gu Ling also pointing，There are sophisticated follow. On the national and provincial art competition，Du Tao's work has won numerous awards，并饋 Okukunisai friends. 1981 won all Kunikubi 屆少 year 兒童 manual method oaza ratio Sai second-Film Awards，1986Year acquisition Tianjin certificate child Cup calligraphy ratio Sai Chief Film Awards，2010Year acquisition 溫哥 Hanagei surgery who cooperation 會年 TenSakae 譽獎，2012Year 其書 method works winners 溫哥 Hanagei surgery who cooperation 會聯 Exhibition. Currently Du 濤不 Tadashize 溫哥 Hana Chinese Arts House cooperation 會終 only 會員，And he was director of Tianjin Overseas Chinese painting and calligraphy. Du Tao residential floor，Piyou a specialized studio，Desk ink mottled，Converge various brush sets. Front wall hanging two new works of calligraphy，Some insights into his latest. He said that throughout a whole look，And each word has a different style and personality. In the studio with the Du Tao chat，Talked about GVRD Canglongwohu，Romantic secluded with all kinds of lurking. On painting industry concerned，Is bursting with talent. Various martial art contests，Could have been a good thing，Help promote the continuous prosperity of local painting and calligraphy. But there are also some worries，Between different regions，Between new immigrants，Between the various types of martial art，It is inevitable that some sectarianism，Each other signs，Good health is not conducive to the formation of creative atmosphere，It should be a warning.